The second smart ship, Anthem of the Seas, is here. 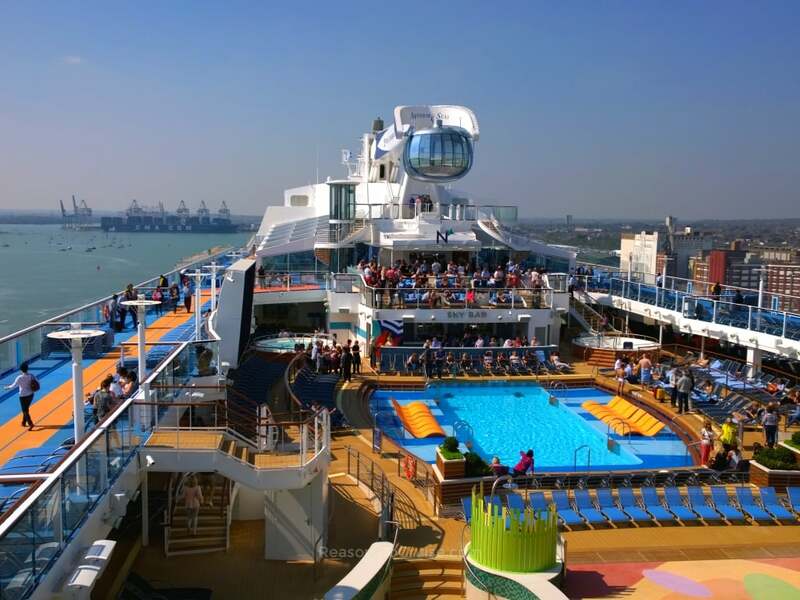 The 168,666 gross tonne ship arrived in Southampton this week, and I sailed onboard a two-night mini cruise to find out what makes this ship so smart. Who does this ship suit? Before you step anywhere near the terminal, you are asked to complete online check-in. Fill in the details, upload a passport style photo (or take a selfie), and then print out your boarding pass. In the terminal, roving staff armed with wrist-mounted iPads replace the redundant check-in desks. A few taps and check-in is complete. Entering the cruise terminal to boarding the ship took me just ten minutes - a far cry from my 2½ hour ordeal years ago. Speed and efficiency matters. 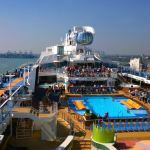 Holidaymakers board the ship in a better mood, and can board earlier than would otherwise be possible. Digital Key cards and wristbands awaited my arrival in the balcony cabin. They look like watches, but these silicone bands can unlock doors - literally. WOW Bands seek to replace the simple key card and can be used to open the cabin door and to pay for drinks on board. After a couple of hours, I ditched mine. While it saved fumbling around for my key card the range was so poor, it was considerably less reliable than the card. Alternatives to the plastic key card are on the horizon, and while WOW Bands are a step forward, they are not perfect yet. One area where technology displays a marked improvement is with the VOOM Internet service. On a press preview sailing you can imagine the number of selfies shared on social media, and yet the Internet service held up. Historically, Internet access on a cruise ship was a joke. Some ships still operate with archaic systems in place. 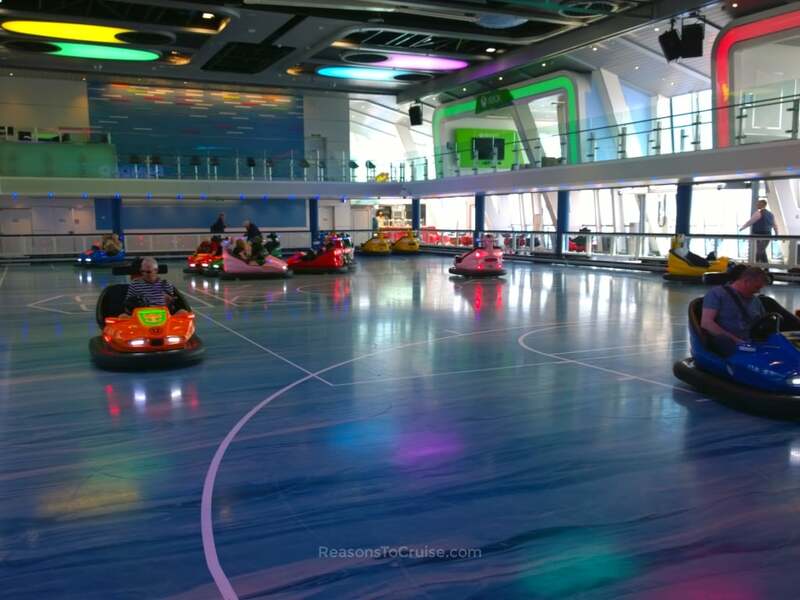 Anthem of the Seas is different. It has a fast Internet service to rival most land-based resorts. It is perfect for sharing selfies, checking emails, and even for making Skype calls. While it is not as fast as fibre optic broadband, the speed is impressive. WiFi coverage is good although cabin walls seemed to weaken the range. 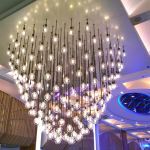 Anthem of the Seas blends solid art pieces with larger digital-inspired art pieces to create a collection that is both interesting and varied. 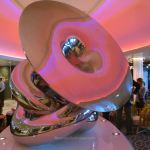 I missed the original pieces on Quantum of the Seas, such as the digital helix, but Anthem of the Seas still boasts an equally diverse collection. Some displays are static, while interactive pieces draw in curious-minded crowds. The Pulse Spiral by Rafael Lozano Hemmer on Royal Esplanade is a paraboloid with 200 light bulbs that dance rhythmically to the participant's pulse. In Guest Services, an installation of wooden blocks connect to a Microsoft Kinect camera. As guests move in front of the camera, the blocks ripple to show their silhouette. Each Quantum-class ship has a stand-out piece of artwork outside on Deck 15. 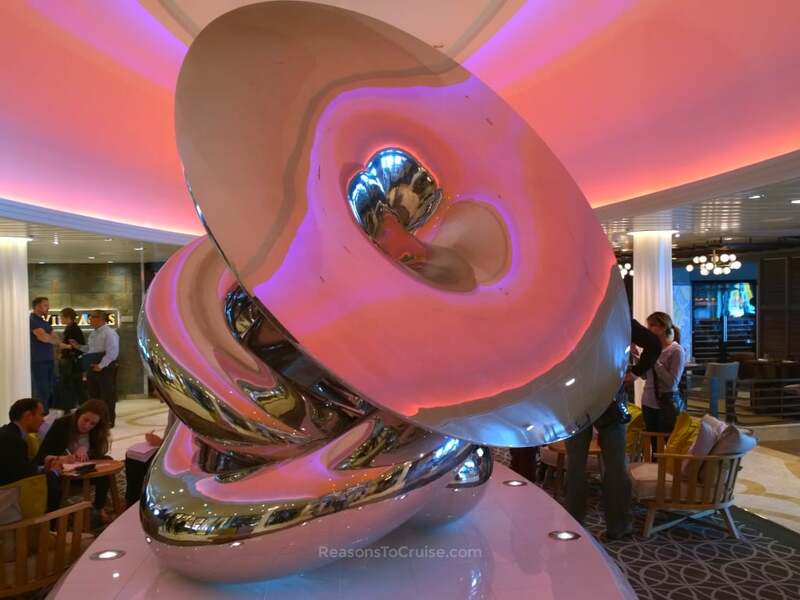 Quantum of the Seas has Felicia the fuchsia polar bear. 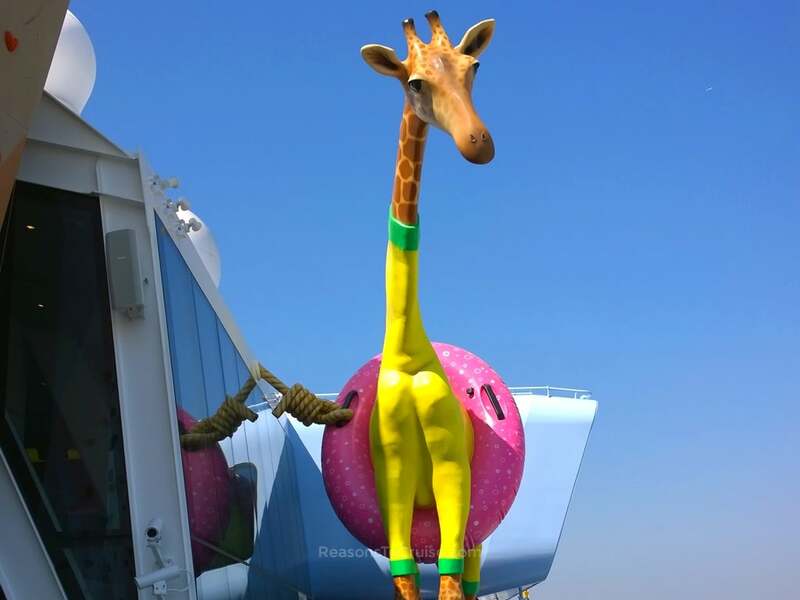 Anthem of the Seas has Gigi the Giraffe. Designed by Jean-François Fourtou, the giraffe sports a bright yellow swimsuit and giant pink rubber ring. 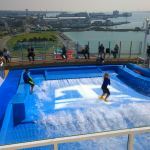 Daredevils will love Ripcord by iFly, indoor skydiving at sea. I prefer both feet on the ground so while I gave it my best attempt, I am not a natural skydiver. It is a frightening, thrilling experience where sixty seconds feels like sixty minutes. 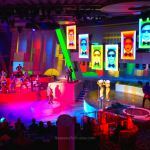 SeaPlex is a versatile venue that effortlessly transforms between a bumper car (dodgems) arena, a basketball court, a circus skills training camp, a roller skating rink, to a disco with floating DJ booth, and a venue for the ever-popular The Quest game show. The dodgems are popular with all ages groups, attracting long but quick moving queues. North Star is the love-child of a London Eye-style pod and a crane. The capsule elevates to a dizzying height of 91½ metres (300 feet) above sea level. The views are great if you can combat your vertigo. But my favourite is Spectra's Cabaret in Two70. Flamboyant and charismatic Spectra together with a troupe of Royal Caribbean singers and dancers takes the audience on a musical journey through many genres of music. The robotic screens elevate this show into something truly spectacular. The soundtrack will send shivers down your spine. When out and about on the ship, keep an eye out for the Stowaway Pianist. A novelty act of improvisational micro-entertainment, this character sporadically appears around the ship for short sets before disappearing. 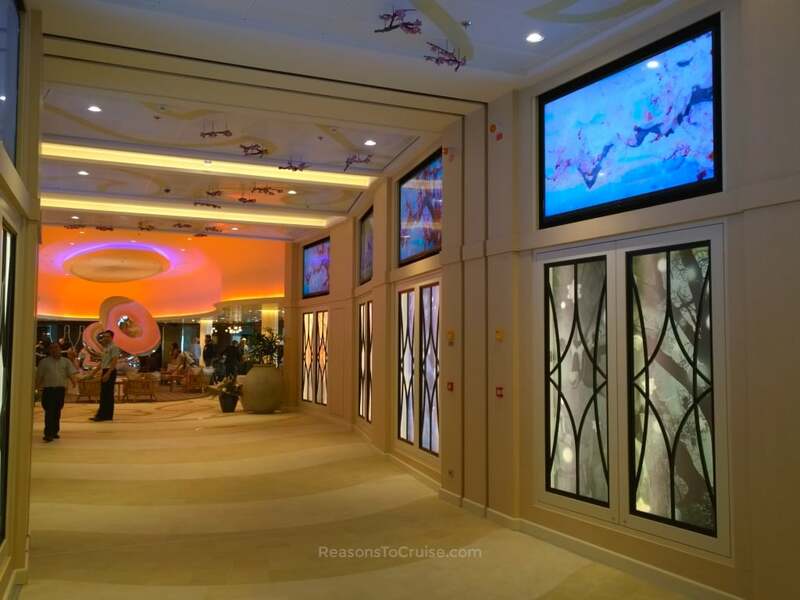 The kids' clubs are identical to those found on other Royal Caribbean ships. Teenagers benefit from access to the Living Room on Deck 14, a cool chill-out space exclusively for teens. 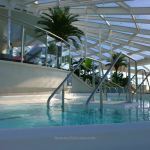 While the ship gears towards non-stop entertainment, tranquillity is available in the Solarium on Decks 13 and 14. 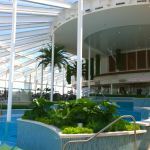 It is warm and humid, and you could endlessly switch between swimming in the pool with cascading lagoons and relaxing on a lounger. Dynamic Dining does away with the traditional main dining room and set dinner times so passengers can dine when and where they like. As a creature of habit, I am not a fan but can understand its appeal. 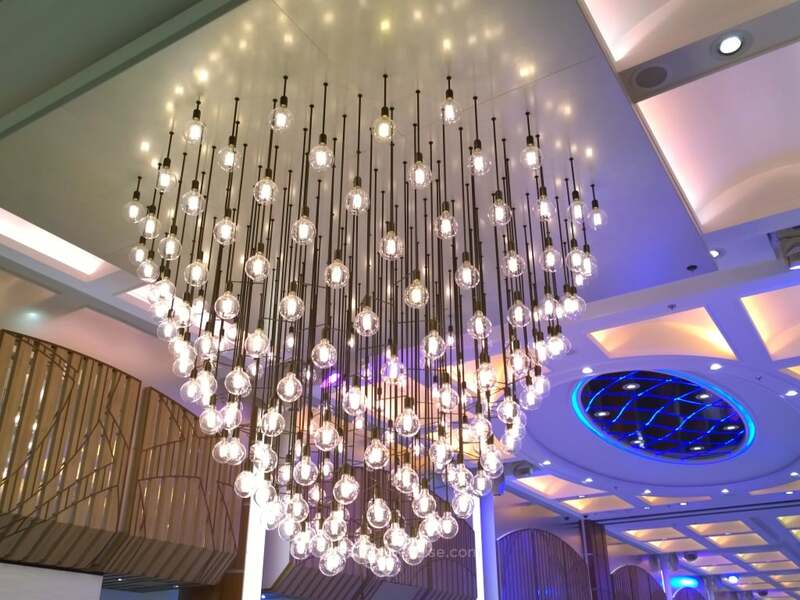 Anthem of the Seas has four main complementary restaurants: American Icon Grill; The Grande; Chic; and Silk. Suite guests can dine in Coastal Kitchen too. 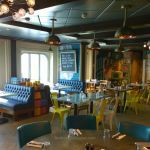 Head to the stylish Windjammer Marketplace for snacks, or Café Promenade, Sorrento's, SeaPlex Doghouse, and The Café @ Two70. The remaining dining venues incur a fee, either on an à la carte or cover charge basis. 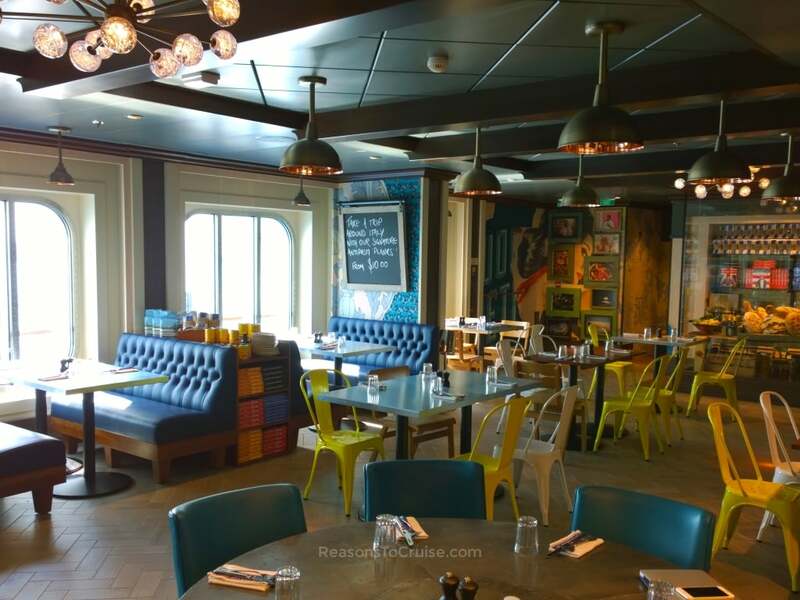 Jamie's Italian at Sea, Jamie Oliver's ship-based restaurant, headlines the premium offerings. Johnny Rockets has become a fast-food outlet rather than a charming 50's style diner, with a drop in quality and service to boot. Chops Grille serves the best steaks on the ship, while Izumi specialises in sushi and sashimi. Wonderland is an eclectic gastronomic experience. Michael's Genuine Pub offers gourmet pub grub, and La Patisserie offers speciality coffee and tempting treats. An array of bars lines the ship, each with a different ambience. 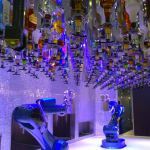 The quirkiest is the Bionic Bar by Makr Shakr. 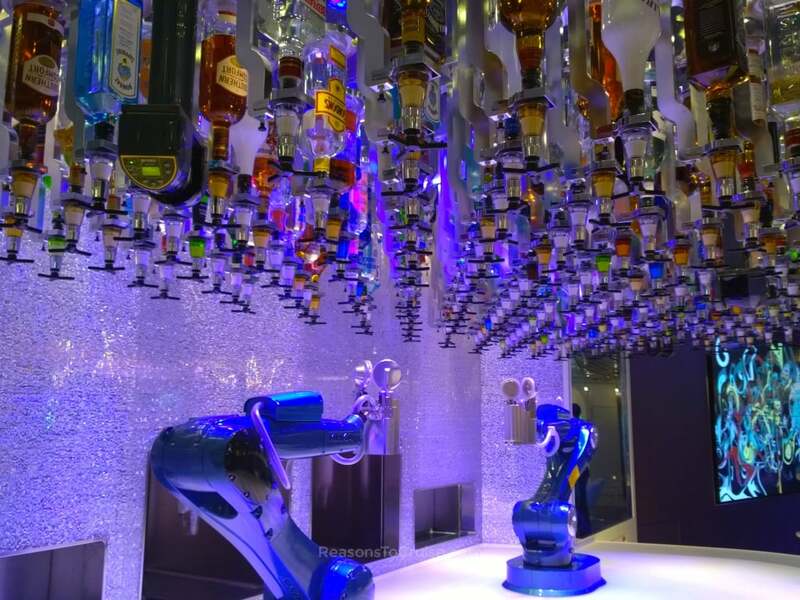 Order through a tablet computer and adapted production line robots will create scientifically precise cocktails. It might be a pricey gimmick, with drinks starting at $4 (&thickapprox; £4), but it is oddly mesmerising at the same time. 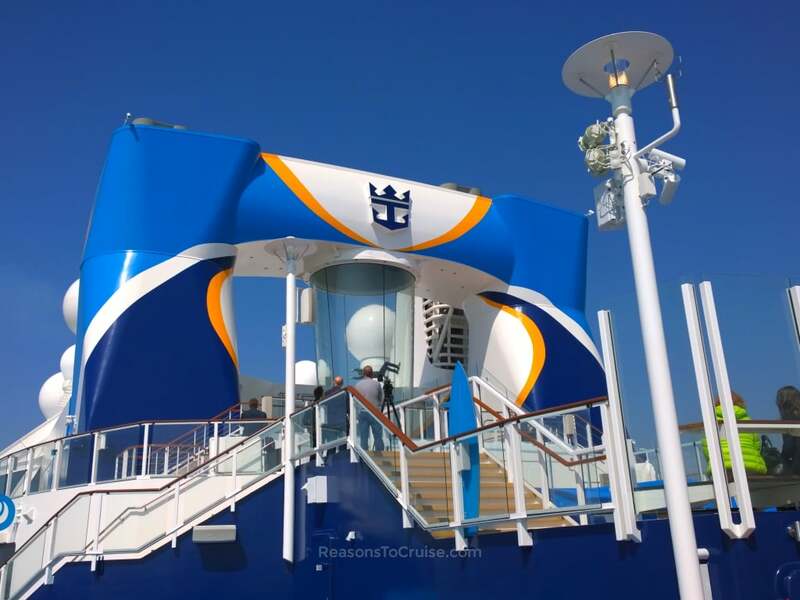 A cruise on Anthem of the Seas feels very different to one on Independence of the Seas. Technology plays a large part in that, but differences in layout and amenities are noticeable. 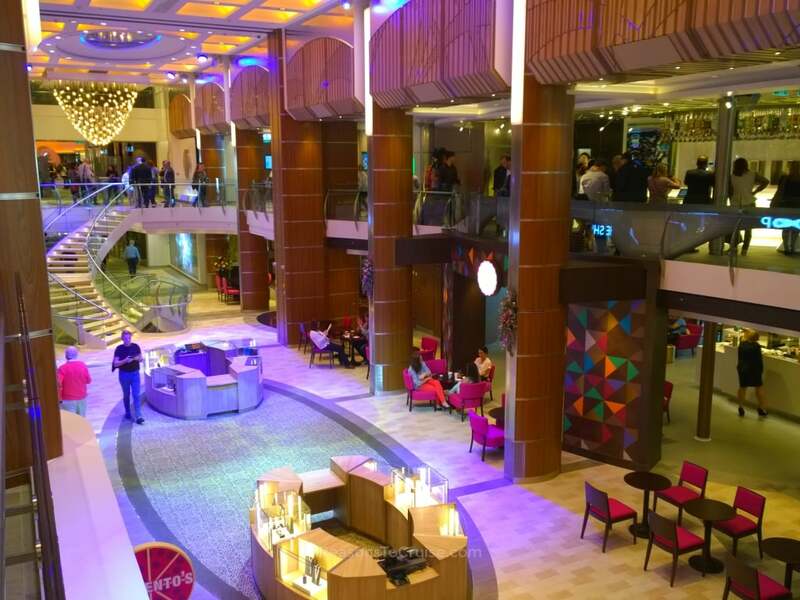 Royal Promenade, the beating heart of Independence of the Seas, makes way for a smaller but loftier . The new space bears more resemblance to a small high street shopping centre than an indoor promenade. 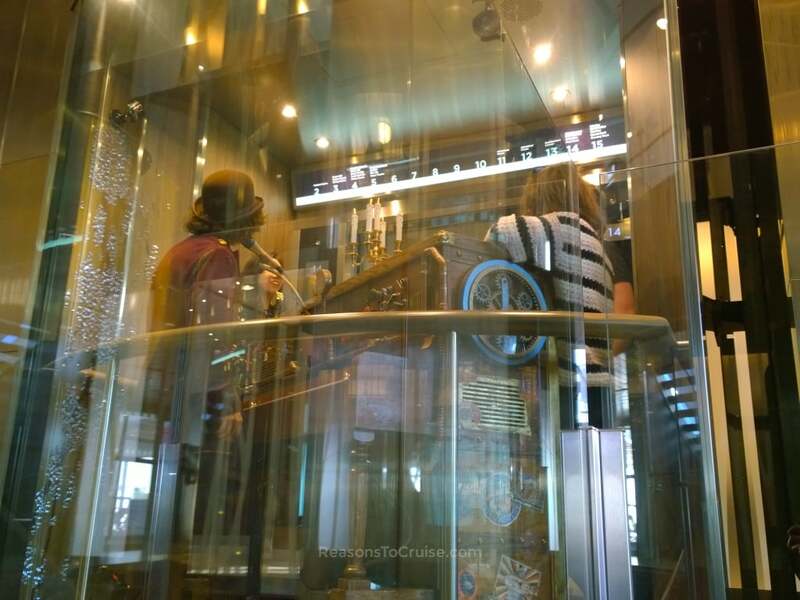 I reviewed Quantum of the Seas previously and discovered few notable differences on Anthem of the Seas. The ships do, after all, follow the same specifications. 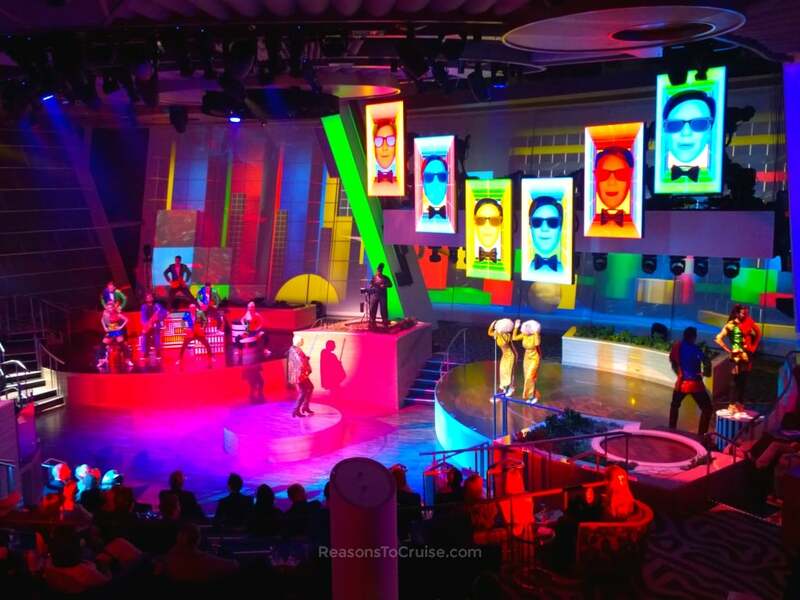 Anthem of the Seas boasts a different collection of digital artwork than its sister ship. The H2O Zone splash area has been toned down, with dull, muted colours replacing the bright, vivid shades found on Quantum of the Seas. 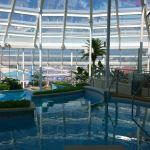 Sail on either ship to experience a high-tech cruise holiday. 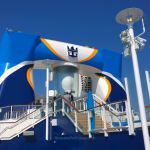 Royal Caribbean are keen to capture a larger slice of the family cruise market, particularly the millennial demographic. The folks that cannot bear to part with their iPhones and iPads for a week. The people who post hourly selfies on social media channels. The business people who need to check their emails or do a spot of work while on holiday. 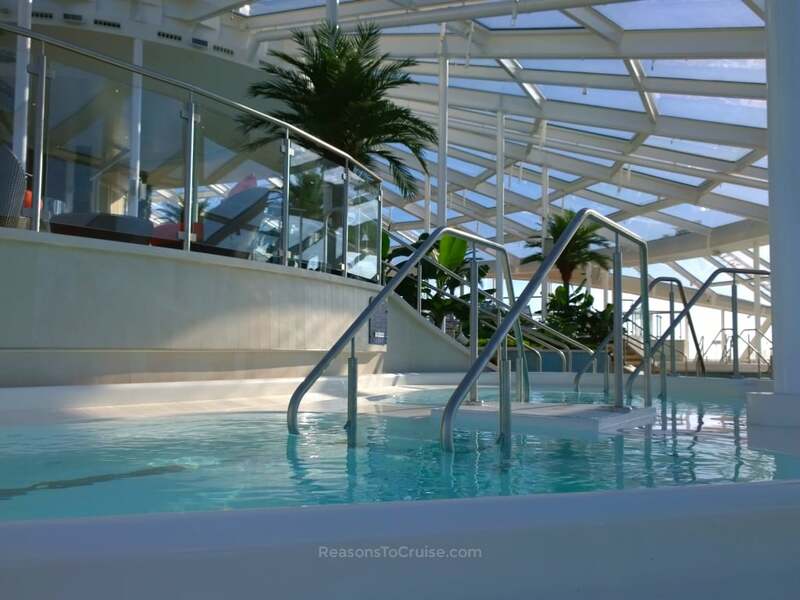 Anthem of the Seas satisfies the demands of even the biggest technology addict or workaholic. 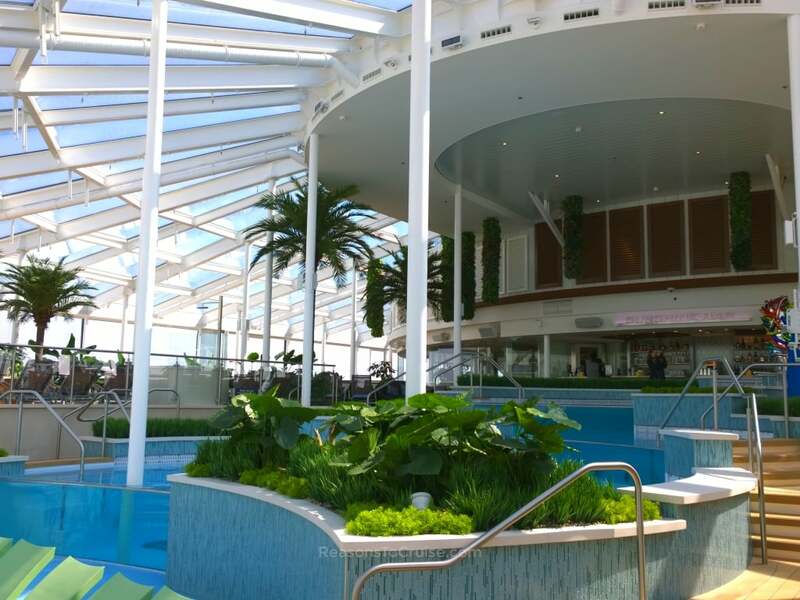 The technological boost risks alienating fans of older ships like Independence of the Seas. 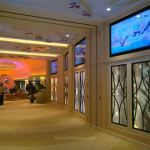 But strip away the technology, and the Royal Caribbean core values and service remains. 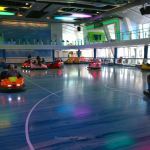 While the ship offers little for children aged under three years, it puts families at its heart, with bumper cars, skydiving, surfing, rock climbing, aerial sightseeing, and more available. 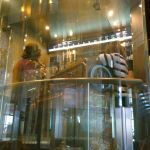 Travelling as a multi-generational unit (children, parents, and grandparents) is a breeze, with something for everyone. 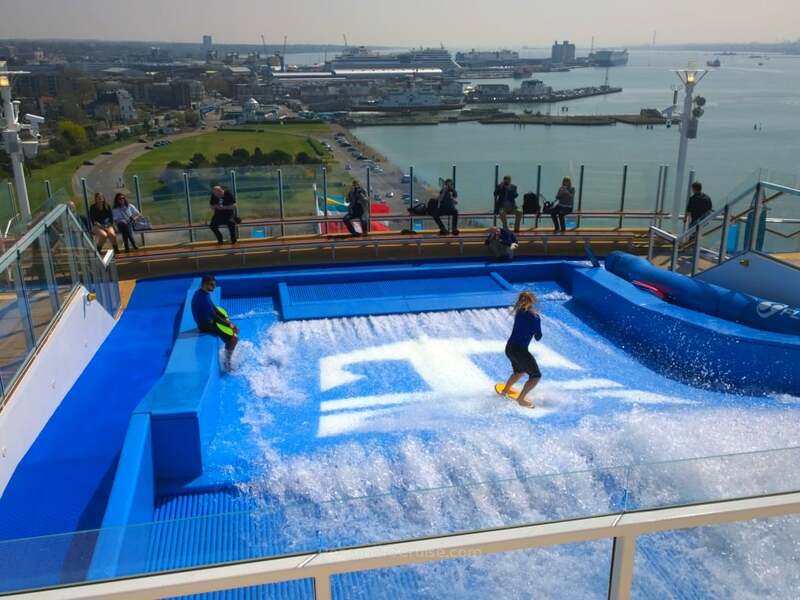 Are the innovations alone enough to tempt you to book a cruise on Anthem of the Seas, or are they a step too far? Let me know in the comments below. A new ship is in town, and it is smart. While many of the experiences available have a novelty factor, the underlying technology brings cruising into the 21st Century. 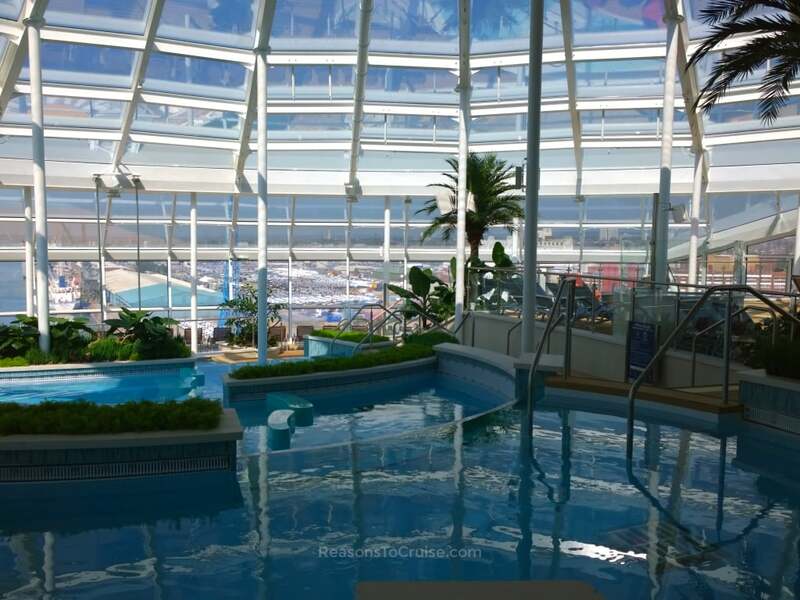 Look beyond it and you will still find the same Royal Caribbean experience.